Meet our BranDD AmbassaDDor: Jess from URI! My name is Jess and I am from Southern Jersey, just outside of Philadelphia. I am a freshman at the University of Rhode Island (URI), where I major in Public Relations and Minor is Leadership Studies. My dream job, upon graduating from URI, is to work for a PR agency. Although Rhode Island is a very small state, our university is home to over 13,000 undergraduate students, making it a medium sized school. With Division 1 sports and a variety of organizations and clubs, there is never a dull moment. In fact, when the Patriots won the championship, the entire campus went insane with excitement! I love being a BranDD AmbassaDDor for Dunkin’ at URI. This opportunity has allowed me to reach out to a variety of groups on campus. Being a freshman, this experience has been such an amazing way to get even more involved. 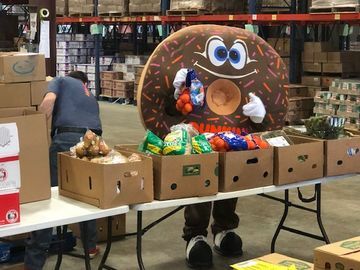 At events such as “Ace of Cakes” and the Greek Alumni Basketball game, I was able to provide Munchkins® donut hole treats and merchandise, as well as promote the Dunkin’ brand. 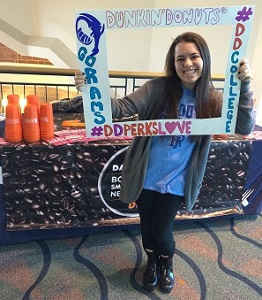 During the basketball game, I had students pose with a photo frame and tweet using the hashtags #DDPerksLove and #DDcollege. 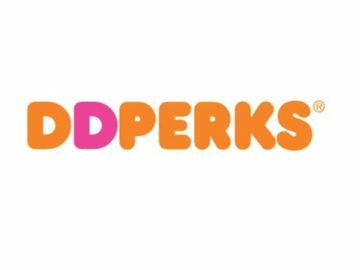 This made the students more aware of the DD Perks® program. In addition to these events, I have been managing the URI Dunkin Instagram account (@Rhodyrep). I’m truly having a great time taking photos and sharing them with my classmates! We also have “free cup Friday and free gift card Friday” where students are asked to comment on where they think a Dunkin’ cup is located on campus in order to win a $5 DD Card. It’s so awesome watching the winners react to receiving their free stuff. 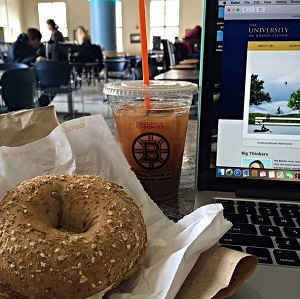 On the URI campus, Dunkin’ Donuts seems to be the center of student life. I am often in Dunkin’ several times a day, and notice that there are students always working on projects or having meetings together. The line is often all the way out the door. 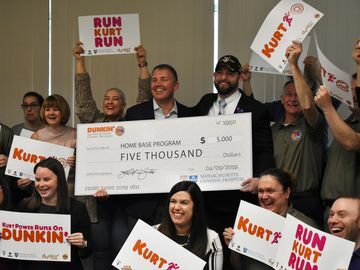 Whether you like Caramel Iced Coffee (my favorite) or Glazed Donuts, you always feel at home when you’re at the URI Dunkin’. Rhody Rams run on Dunkin’! *Are you a current student that is looking to join our BranDD AmbassaDDor roster in the future? Drop us a note (dunkincollege@gmail.com) to let us know where you go to school and why you should be our rep!